Hillside is a South African medical drama television series created by Aubrey Sekhabi, Mpumelelo Paul Grootboom and Itumeleng Motsikoe which showcases the lives of young doctors and nurses full of passion for their profession and the hope of a successful new hospital. They live for their work but also have an emotional need for friendship, support, love and intimacy from each other in this safe cocoon far from the demands of another world they call home but hardly ever see. The show is filmed in a working public hospital and is fashioned on real life medical cases with stories that seamlessly blend reality and fiction. In some ways the hospital is the hero, but the real heroes are the medical staff. The storylines often focus on the contrasting 'family' bonds at the hospital and the different kinds of families that are seen in today's contemporary world. Often the outside world rushes in uninvited bringing horror, wonder and sometimes disgust, all the while placing pressure on the relatively new staff with limited resources. The central focus is the family and how we process the emotional events that affect us in sickness, in health and in death. 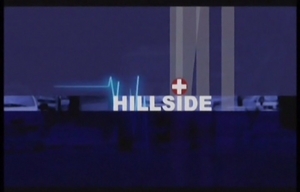 The first season of Hillside was shot at the newly-built Pretoria Academic Hospital before it became operational, but since that hospital is now fully functional a new location had to be found for Season 2. The Meulmed Medi-Clinic on Pretorius Street in Pretoria/Tshwane, part of the Medi-Clinic group of hospitals, came to the rescue. The old administration area in the hospital was moved into premises next door and the Hillside design team under the direction of Mmamitse Thibedi moved in to completely tear down the area and build up the set, which comprised an emergency reception and casualty treatment rooms. The Meulmed Medi-Clinic also supplied offices and most importantly access to their intensive care ward, operating theatre and limited access to corridors and some other areas of the hospital. Filming took place over 15 very intensive weeks from October 1st 2007 to the end of January 2008. Hillside is filmed primarily in Tswana, Sesotho, Xhosa, Zulu and Afrikaans (60-80%), with some use of languages such as English (20%), Venda and Tsonga. The series is produced by GBR Productions with executive producer Aubrey Sekhabi. The series is directed by Teddy Mattera and is produced by David Max Brown. Writers include Mpumelelo Paul Grootboom, Aubrey Sekhabi and Martin Mpe. Original music is by Ezbie Moilwa. Returning shows tonight include Chopped on Food Network, The $100,000 Pyramid on 1Magic and Live at the Apollo on BBC Brit. The MTV Base VJ Search 2018 kicks off, BBC Brit investigates Russia's War on Women and SABC2 does a re-run of Hillside. Coming to SABC2: Huis van Liefde - the third series in the Mini-Series Festival and a new gameshow The Generation Game replaces Strictly Come Dancing 4.